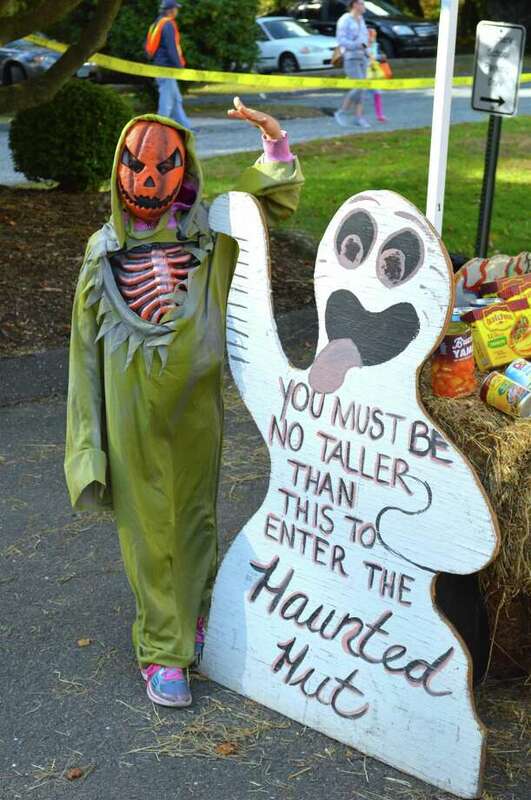 Naisha Maheshwari, 8, of Fairfield, measures up to a ghost at the second annual Trunk or Treat tailgate Halloween event at the United Methodist Church, Saturday, Oct. 28, in Westport. ’s Counseling and Psychological Services received a $10,000 grant for opioid awareness initiatives as part of the Statewide Healthy Campus Initiative, launched by the Department of Mental Health and Addiction Services. According to the Centers for Disease Control, drug overdose deaths in the United States more than tripled from 1999 to 2015. Increasing awareness of the potential for fatal overdose. Increasing access to treatment through education about the availability of resources on campus. Informing the campus community of the availability of Narcan on campus to save lives. All public safety and Health Center employees have been trained to administer Narcan. Highlighting the value of a Collegiate Recovery Program, which pairs education with recovery. To remember all of those who died of overdose deaths in Connecticut last year, 917 purple flags will be placed on the campus’ traffic circle and there will be a vigil at the traffic circle at 6 :30 p.m.
Other events during the day include a demonstration on administering Narcan — the brand name for the overdose-prevention drug naloxone — at 12 and 5 p.m. in the Barone Campus Center. There will also be information booths set up in the Dolan School of Business from 1-3 p.m. and at the RecPlex from 3-5 p.m. and a screening of the documentary “If They Had Known” at 7 p.m. in the Aloysius P. Kelley Center, followed by a panel discussion. The documentary is about the fatal overdose of a University of Denver sophomore and the tragic risks of today’s party culture. This exhibition explores these messages and how they influenced people in the Fairfield and Bridgeport area, where wartime manufacturing made the city a boomtown. Also on view are uniforms, memorabilia, letters from locals serving in WWI and more. The exhibition runs through Jan. 21 in the Spaght Gallery. The Fairfield Museum, at 370 Beach Road, is open seven days a week, 10 a.m. to 4 p.m.
Signs direct people to and fro and call attention to specific places, events and locations. Beyond the words they carry, they use symbols, color and design to communicate their message. The collection of Fairfield-related signs on display range from commercial signs to informational pamphlets. In addition, visitors can learn how some of Fairfield’s streets got their names, and try their hand at making their own signs. The exhibition runs through the end of Thanksgiving weekend, Nov. 26. The Fairfield Museum, at 370 Beach Road, is open seven days a week, 10 a.m. to 4 p.m. For information, call 203-259-1598 or visit Fairfieldhistory.org.